Paul Foster was created to add appeal to the younger female viewers and balance out some of the eye candy. My wife prefers the dark haired hairy chest type (I’m surprised she married me) so based on her likes I can understand how he may have appeal to some members of that subset of viewers. I saw Paul early on as a hot-headed upstart with ambitions of one day commanding SHADO. He was brash and often disobeyed orders or standing procedures. (Conflict, Psychobombs) But he was also fiercely loyal to Commander Straker and those he considered friends. In “Conflict” Paul shows his disregard for orders by flying a return to earth mission under a shutdown order (Washington Square) in an attempt to prove the loss of his friend was something other than pilot error. The disregard for orders was balanced by his loyalty to his friend (Maddox). His brashness also shows when he snaps at the General when he and Straker go to see him upon his return to earth. Straker wanted to but was held in check by discipline. Paul’s loyalty to the Commander is shown later when Henderson orders him to take over and he refuses, instead supporting the Commander. That was one of his most shining moments in the series. Paul has gotten a raw deal in FanFiction and is often shown in poor light. In my stories I see him starting off as brash and cocky but growing over time. In the end of “Silver Star” we find out that Paul had a troubled childhood which affected his ability to form and keep meaningful relationships. The story ends with Ginny and Paul breaking off their brief relationship and Paul seeking counseling. I put that as a turning point for him in both my storylines. Paul made one very poor decision in “Psychobombs” when he brought Linda Simmons to the studio knowing that she posed a threat to both the Commander and the base. It really isn’t clear whether Foster was under hypnotic control or just made an incredibly grave error in judgment. Straker had obviously decided on the same course of action (much to Ginny’s chagrin) and allowed him to slide for it. In my story “A Matter of Principle” I show Ginny getting on Paul about that decision and Ed, in a calculated oversight, allows it. This is another story where Paul gets to grow as he realizes the gravity of the mistake. In my story lines, Paul grows and matures into an effective member of the SHADO command team, and in the Hewett series, he rises to executive officer, (Alec has died of cancer) when Ginny marries and transfers back to New York. In the “Soul Mates” saga story “Expecting”, Paul really shines when he is forced to take command, when an explosion traps Ed and Ginny in their quarters at HQ. When Ed recruited him in SHADO he saw potential in the man and that trait rises to the surface in this story. I marry him off in both my story lines to Jane Carson from the episode “The Dalotek Affair” and in the first story of the Hewett series he tells Ed that his wife is expecting their first child who was named Alec. I have seen personal growth in Paul in other writer’s stories as well. 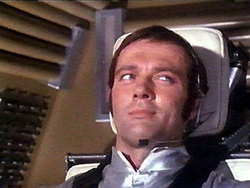 In Denise’s “Devilsgate Saga” Paul abandons his post on Moonbase to come to Earth and Commander Davenport slaps him down hard having him cool his heels in the brig for desertion. Later when the two men meet, we find some of what drives Foster come to the surface. Jake Davenport showing wisdom beyond his years recognizes the potential in Foster and gives him a chance to redeem himself. We also see that Paul was fiercely loyal to Ed a trait Denise brought out very well in the story. In Louise’s story “AfterMath” a decision made by Paul causes a worldwide apocalyptic disaster and Paul learns the hard way that he needs to think before he acts. Over the course of the story Paul grows into the team leader that Ed knew he had the potential to be, and he gives his life to save the Commander. As a writer I do find him fun to pick on early in the series but I also enjoy growing his character as I did in “Expecting” a truly fun story to write. And Paul got to be the hero.